To maximize group performance, players must effectively combine their individual efforts and abilities to create one smooth functioning whole. Passing, receiving and heading skills provide the vital thread that enable 11 teammates to play as one. Mastery of these skills will enable teammates to maintain possession of the ball, dictate the tempo of the game and ultimately create and finish scoring opportunities. 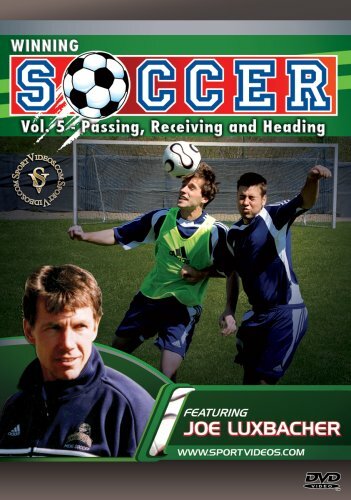 This comprehensive program provides coaches and players with a variety of exercises designed to improve their ability to pass, receive and head the ball effectively. This DVD is an essential training tool for players and coaches at any competitive level! About the Coach: Dr. Joseph Luxbacher has been involved in the sport of soccer for more than 30 years as both a player and a coach. A former professional player in the North American Soccer League (NASL), American Soccer League (ASL), and Major Indoor Soccer League (MISL). Luxbacher is the head mens soccer coach at the University of Pittsburgh and has twice been named Big East Athletic Conference Soccer Coach of the Year.